God is there in unexpected events, inspiring people and reminding them that He is ultimately in control. 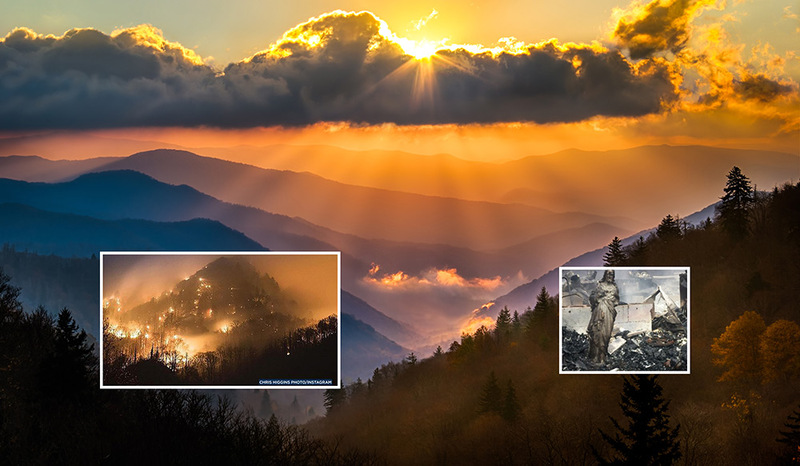 The Tennessee wildfire disaster in the Smoky Mountains and tourist meccas of Gatlinburg and Pigeon Forge is quite literally a trial by fire. 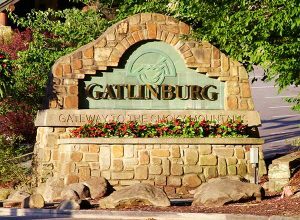 Almost 20 percent of the city of Gatlinburg is damaged or destroyed. Pigeon Forge also has suffered great loss. Many churches. Scores of mountain cabins. Many tourist attractions, often family-owned and built with sweat equity over several generations. At last count thirteen people perished in the flames and smoke, and the number is rising. In addition there is great damage to the magnificent forests of the Smoky Mountain National Park. 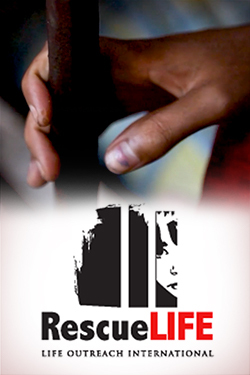 Doubtless you have seen the horrific video footage and heard the statistics. But the real story will emerge in the coming days and months. I predict a nation which was late to even hear about the disaster will be amazed at the miracle, already emerging, that will show the world what happens when a community with such resilience comes out of the trial by fire. The Smoky Mountains, and even the very “commercialized” tourist meccas nestled there, hold precious jewels that constantly surprise observers and visitors alike. The natural breathtaking beauty of the land, the sensuous nature of the deep forests and rousing streams, and the primal gut feeling that arises when one gets deep into the woods on an isolated mountain ridge — are all part of the magic. But even that is surpassed by an ethos of faith and spirit inherent in the mountain people who live there. They and their forebears built their homes there, built old-fashioned businesses there, take care of each other there, and, yes, make millions of dollars yearly hosting guests from all over the world there. Millions who visit and thousands who come to live there are drawn not only by the opportunity and the natural beauty, but also by a pioneer spirit and sense of community that once permeated frontier America. It is disappearing in most places now, but still vibrates strongly in the Smoky Mountains. And, as fire is a tester of all things material and spiritual, the people have been tested to their limit the past few days. But I predict that the precious materials of heart and soul these people possess will not only pass the test, but will amaze the world in the coming months and years. I grew up in East Tennessee and spent a lot of time in those mountains and a significant portion of my early business life working with businesses there. The people not only exude a more simple Christian spirituality (evidenced by the old-fashioned “singings,” the spartan mountain churches, and the many references to God and prayer even in the shops and tourist attractions) but they also act out their faith through their love of hospitality and their generosity to strangers. And they especially take care of each other. This has already been proven in this tragedy. Many of the community leaders stayed out in front to help others even while their own homes and businesses burned. The mayor of Gatlinburg was one of those people. The mayor went on to tell of a number of first responders who, once they knew their families were safe, stayed on the front lines fighting fires in the town even as they knew their own homes were burning down. In his first news conference after the disastrous wildfires Tuesday night, Mayor Werner started with thankfulness. Then he said: The most important thing to thank everyone for is your prayers.” Faith comes first to many of these folks. The Stream Facebook page posted this meme Tuesday morning and the response was the greatest engagement we have ever seen on our Facebook and social media. Speaking of prayer, I want to thank Stream readers worldwide for your prayer support. 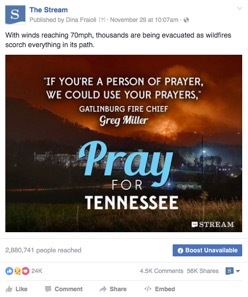 The Stream’s Facebook page has had far and away the largest response EVER to a single meme we put up there Tuesday morning when it became evident that a disaster was unfolding. Driven by 70 mile-an-hour winds, the wildfire had raced through the Smoky Mountains and rapidly attacked Gatlinburg and Pigeon Forge. The towns seemed headed for certain destruction. The word went out. RAIN was desperately needed to save the towns. PRAY! That meme from The Stream quickly spread, reaching nearly 3.5 million people so far, generating 350,000 shares, likes and comments. People around the world care about the spirit of the people in those mountains and they prayed and encouraged many others to pray too. And you know what? It rained. And then rained some more. It had been five weeks since there was any significant rain in East Tennessee and North Carolina. But it rained! Other things have happened as well, inspiring people and reminding them that God is ultimately in control. There is the story of the burned page of the Bible found by a worker at Dollywood, and the message many see in that page. There is the haunting image of a statue of Christ taken by a news photographer visiting one of the burned out homes on the mountainside, as reported by CNN and others who gained hope by seeing it. But my greatest source of hope and — dare I say it — optimism, is knowing the people there, knowing their faith, and knowing the God whom they love and serve. They appear simple to many on the outside and I am sure that is part of the charm of the place (admittedly they play it up well). But things are not all as they seem. There is a deep and abiding strength and wisdom that much of America and the larger world has lost — a sense of knowing what is really important and knowing what is just for fun and celebrating both. I’ll illustrate it with a story. (We Tennessee folk love our stories.) When the tourism business was taking off and hotels and resorts were going up everywhere, a reporter from “up North” came in to do an interview on how the boom was affecting the poor, local mountain people. 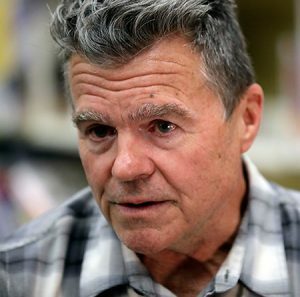 He found one mountaineer in his overalls sitting in a rocker on the porch of his ancient family log home, an acre or so right on a main thoroughfare wedged between new tourist attractions and hotels. “I don’t reckon so,” was the answer. How refreshing to be around a people who do not feel the need to change like the rest of the world around them but remain solid in their old-fashioned values and, above all, in their faith. How encouraging in a week of tragedy to know how the people of the Smoky Mountains endure. They have hiked their britches and rebuilt before, and each time come back better. And then more and more folks from all over the world come to “stay a while.” And they too discover the secret that isn’t so secret.